If pay day is just around the corner and you’re a strong believer of treating yourself, we’ve rounded up the best designer collaborations you need to know about. Get in on the action and take note so that you don’t miss the rush of these exciting new collections. To continue its tradition of designer collaborations, Uniqlo have looked to one of British’s most exciting new designers, J.W Anderson, for the next collection. Propelled into the spotlight by the Pearce bag last year, this cult brand is now up with the big boys. Set to launch the collaborative collection in Autumn this year, get ready to fight your way towards t-shirts and cashmere jumpers with a signature twist from the designer. The Ukrainian label best known for bringing back shell suits has teamed up with the prestigious French brand Vetements for an exclusive footwear collaboration. Whether you're feeling brave to embrace Florescent satin boots like RiRi or prefer elegant satin sling backs they are sure to up the anti of any outfit. Grab yourself some investment pieces for the summer season over on NET-A-PORTER.com now. Louis Vuitton has teamed up with the American artist best know for his work with popular cultural subjects, such as the famous Stainless steel balloon dog statue. 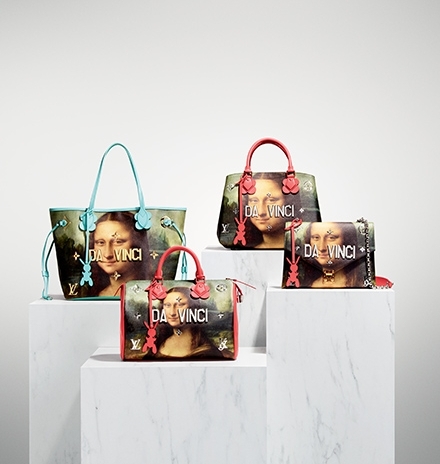 The Masters collection of accessories features famous artworks, including the “Mona Lisa” or Van Gohh’s “Wheat Fields and Cypresses”, represented on classic LV pieces. Each bag contains a biography and portrait of the artist, along with a tag of Koon’s inflatable rabbit. His initials are also shaped into the LV logo- the first time the brand has allowed their formidable logo to be played with. Available in selected stores from 28th April, this is set to be only the beginning of the collaboration.